There are two small matching portraits by Fabre of Queen Louise and her companion Count Vittorio Alfieri. 5 The oil on canvas portraits are both oval in rectangular frames and measure 32 cm X 25.5 cm. They were painted in 1796, and are somewhat less romantic than the portraits of 1793 now in the Galleria degli Uffizi in Florence. Louise wears a lilac shawl with a blue and orange border. On her head she wears a green hat. 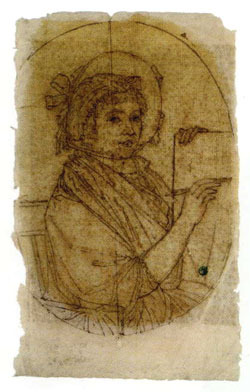 She is shown sketching a man's portrait. Fabre donated the paintings of Louise and Alfieri to the museum in 1825, but retained them in his own possession until his death in 1837. The museum also owns the preparatory sketch for the oil portrait of Louise. 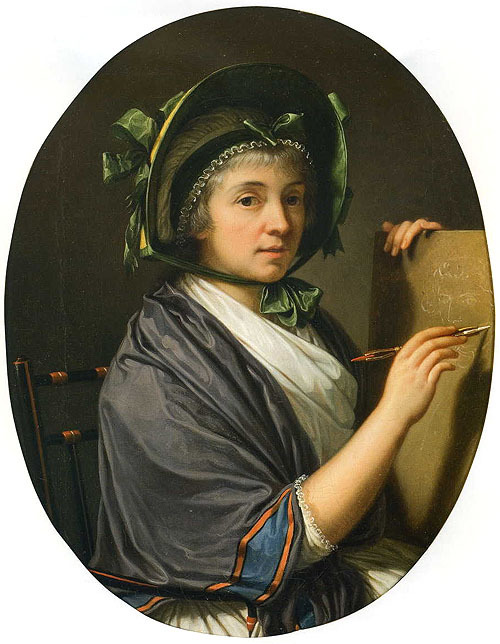 The portraits of Louise and Alfieri (but not the sketches) are on display in Room 27 - Salle Fabre. In January 1996 the museum acquired another portrait of Queen Louise by Fabre; the oil on canvas painting measures 35 cm X 26.6 cm and dates from 1812. 6 Louise is shown in three-quarter profile looking left. She wears a grey-blue dress covered by a golden shawl with a floral print. On her head she wears a muslin bonnet with many gatherings and decorated with a blue and white silk ribbon. This portrait was originally painted by Fabre for Adèle de Souza whose Parisian home was frequented by Queen Louise in 1809 and 1810. It is on display in Room 27 - Salle Fabre. 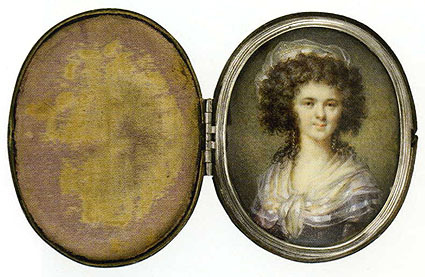 There are two miniature portraits of Queen Louise. In the second miniature Louise is shown wearing a mob-cap on her head, and a black lace shawl around her shoulders; she wears a similar outfit in the famous portrait by Fabre of her and Alfieri now at the Uffizi in Florence and the Museo Civico d'Arte Antica in Turin. In 1825 Fabre also donated an oil painting of Beau Pyrrhus, Queen Louise's favourite dog Pirro (Pyrrhus). 10 Fabre painted this work in 1823 and gave it to Louise as a birthday gift on August 25th that year; it measures 65 cm X 98 cm. 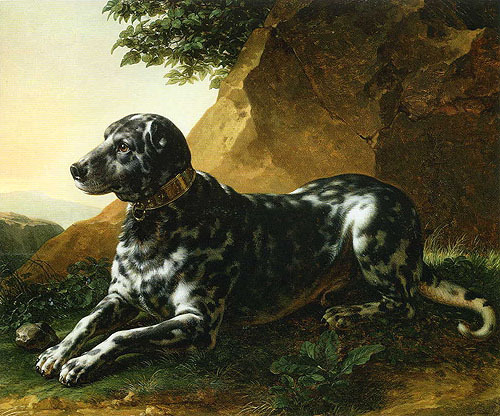 The black and white dog wearing a gold collar (on which the artist has signed his name) is shown lying in a rocky landscape. At the right of the painting on the rock face behind the dog is the following inscription, "Portrait du Beau Pyrrhus, offert à Mme la Comtesse Louise d'Albany, en reconnissance de son grand amour pour lui. Florence, 25 août 1823." 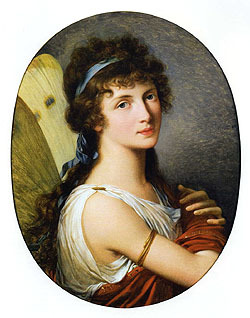 (Portrait of Beautiful Pyrrhus, given to Madame the Countess Louise of Albany, in recognition of her great love for him. Florence, August 25, 1823). Pyrrhus also appears in a painting by Fabre now in the museum of the Fondazione 'Centro di Studi Alfieriani' in Asti. The museum owns a number of other paintings which were formerly in the collection of Queen Louise. Two of the most significant are a portrait of Anne Bermingham by Fabre, and a copy of this portrait by Queen Louise herself. 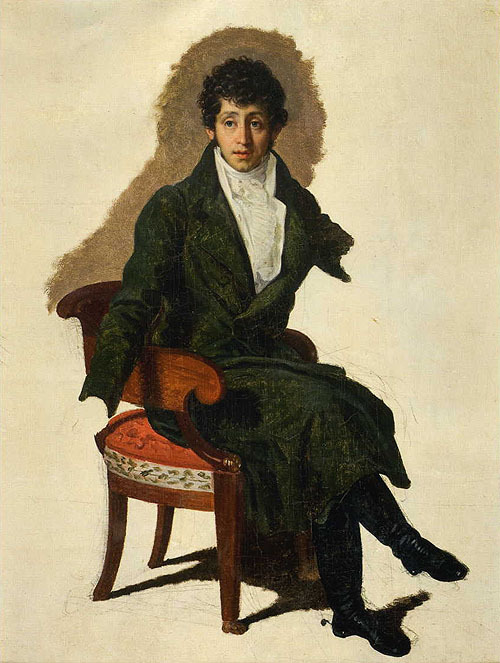 11 Fabre painted his portrait in 1796; the oil on canvas painting measures 58.5 cm X 45 cm. It formerly hung in the library of Palazzo Gianfigliazzi in Florence. The model is shown in the guise of the Roman goddess Psyche with buterfly wings and a blue silk ribbon in her hair. Ann Bermingham was the youngest daughter and co-heir of William Bermingham, of Ross Hill, co. Galway; in 1802 she married the 5th Viscount Charlemont (called "2nd Earl of Charlemont"). It is possible that she was related to the Bermingham family who lived in exile at Saint-Germain-en-Laye. Other paintings formerly in Queen Louise's collection include Fabre's The Vision of Saul (1803); 12 Fabre's Ugo Foscolo (1813); 13 and Fabre's The Death of Narcissus (1814). 14 The museum also owns the library of Queen Louise. The museum is located at 39 boulevard Bonne Nouvelle. Open Tuesday to Friday from 9.00 a.m. to 5.30 p.m., Saturday and Sunday from 9.30 a.m. to 5.00 p.m.; closed Monday. Entrance fee: 20F. (Telephone: 33 04 67 14 83 00; email: musee.fabre@ville-montpellier.fr). 1 The French painter, printer and collector, François-Xavier Fabre was born in Montpellier in 1766, and died in the same town in 1837. He studied under Jacques-Louis David and in 1787 won the Prix de Rome. In 1793 he moved to Florence where he was introduced to Queen Louise by the Bishop of Derry, Lord Howard de Walden (called "Earl of Bristol"). Fabre's brother, Edouard Fabre, was physician to Louise's companion, Count Vittorio Alfieri. 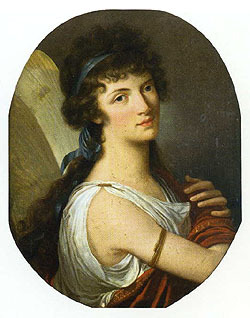 After Alfieri's death in 1803, Fabre became Louise's companion. 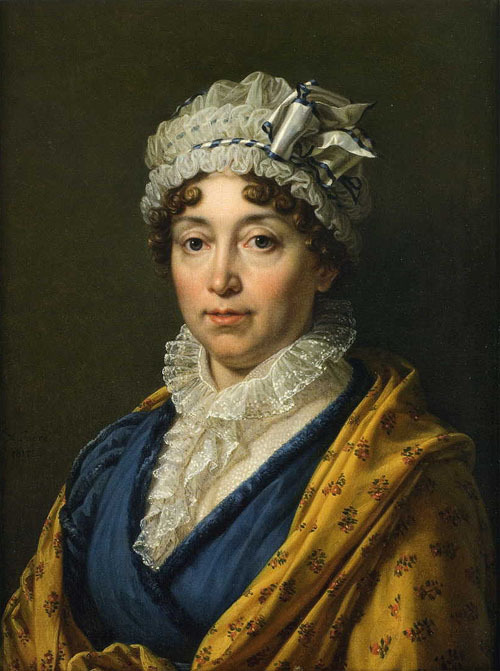 When Louise died in 1824, she left the majority of her estate to Fabre. In 1830 he received the title of baron ad personam from King Charles X of France, brother-in-law of King Charles IV and King Victor. 2 Anton Raphael Mengs was born at Usti in Bohemia in 1728, and died at Rome in 1779. He painted portraits of Pope Clement XIII, several cardinals, and numerous princes. He also painted portraits and other paintings for a number of Englishmen and Scotsmen, cf. Steffi Roettgen, Anton Raphael Mengs, 1728-1779, and his British Patrons (London: Zwemmer, 1993). 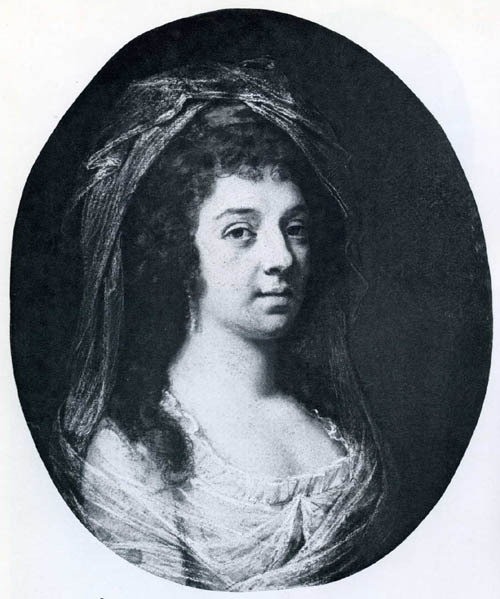 3 Steffi Roettgen, Mengs: La scoperta del Neoclassico (Venezia: Marsilio, 2001), 258. 4 "Il card. 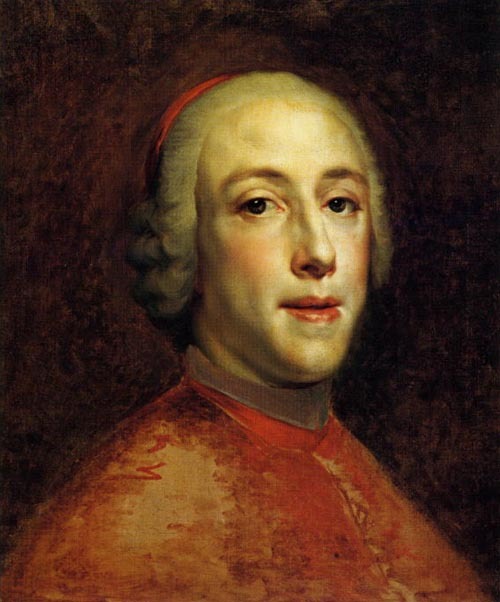 Enrico Stuart, duca di York, Arciprete della basilica Vatican (1725-1807)", La Basilca di S. Pietro, Notizario Mensile 10, n. 7 (Luglio 1998): 2. 5 François-Xavier Fabre, XXXI Festival dei Due Mondi - Spoleto (Roma: De Luca Edizioni d'Arte, 1988), 46. 6 Laure Pellicier and Michel Hilaire, François-Xavier Fabre (1766-1837) de Florence à Montpellier (Montpellier: Musée Fabre, 2008), 378-379. 7 John Kerslake, Early Georgian Portraits, National Portrait Gallery (London: Her Majesty's Stationery Office, 1977), 3. Hugh Douglas Hamilton was born in Dublin in 1739 and died in the same city in 1808. He moved to Italy in 1779 and lived in Florence from 1783 to 1785. Several other Stuart portraits are ascribed to him including an oil of King Charles III, an oil of Queen Louise, and a pastel of King Henry IX, all three purchased in 1873 by the National Gallery in London. 9 Laure Pellicier and Michel Hilaire, 394-395. In 1818 Fabre also painted a portrait of the Duke of Berwick's half-sister, Doña Maria-Elena de Palafox y Fernandez de Silva (daughter of his mother and of her second husband, Don Vicente de Palafox y Silva, 8th Marques de Ariza y de Estapa); this portrait is now in the collection of the Duque de Infantado in Madrid. 10 Ibid., 53. Louise's dog Pyrrhus is also said to appear in another painting by Fabre, "Oedipus on Mount Citheron", now in the Museo Alfieriano in Asti - but the dog in that work has very different colouring. 11 François-Xavier Fabre, 45. Anne Bermingham was the youngest daughter and co-heir of William Bermingham, of Ross Hill, co. Galway; in 1802 she married Francis William Caulfield, 5th Viscount Charlemont (called "Earl of Charlemont"). Queen Louise left this painting to Fabre at her death in 1824; in 1825 Fabre donated it to the museum. 12 Ibid., 48-49. Queen Louise left this painting to Fabre at her death in 1824; in 1825 Fabre donated it to the museum. 13 Ibid., 52. Ugo Foscolo (1778-1827) was an Italian poet; in 1812 he met Queen Louise who became his patron. Cf. Herbert M. Vaughan, The Last Stuart Queen, Louise, Countess of Albany: Her Life & Letters (London: Duckworth, 1910), especially 293-320. Fabre painted this work at the request of Queen Louise who kept it in her collection for three years before sending it to Foscolo. It was donated to the museum in the 1930s. 14 Ibid., 52. Queen Louise willed this painting to the Galleria degli Uffizi in Florence, but at her death in 1824 it was kept by Fabre; he donated it to the museum in 1825. Image 1 (King Henry IX and I): Roettgen, Mengs: La scoperta del Neoclassico, 259. Image 2 (Sketch of Queen Louise, by François-Xavier Fabre, 1796): Pellicer and Hilaire, 182. Image 3 (Portrait of Queen Louise, by François-Xavier Fabre, 1796): Pellicer and Hilaire, 183. Image 4 (Portrait of Queen Louise, by François-Xavier Fabre, 1812): Pellicer and Hilaire, 379. Image 5 (Pastel of Queen Louise): Kerslake, II, plate 8. Image 6 (Cameo of Queen Louise): Pellicer and Hilaire, 150. Image 7 (Cameo of Queen Louise): Pellicer and Hilaire, 152. Image 8 (Portrait of the 7th Duke of Berwick, by François-Xavier Fabre): Pellicer and Hilaire, 395. Image 9 (Beau Pyrrhus, by François-Xavier Fabre): Pellicer and Hilaire, 403. 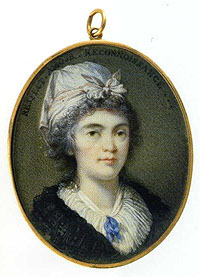 Image 10 (Ann Bermingham, by François-Xavier Fabre): Pellicer and Hilaire, 179. Image 11 (Ann Bermingham, by Queen Louise): Pellicer and Hilaire, 178. This page is maintained by Noel S. McFerran (noel.mcferran@rogers.com) and was last updated August 3, 2016. © Noel S. McFerran 2000-2016.